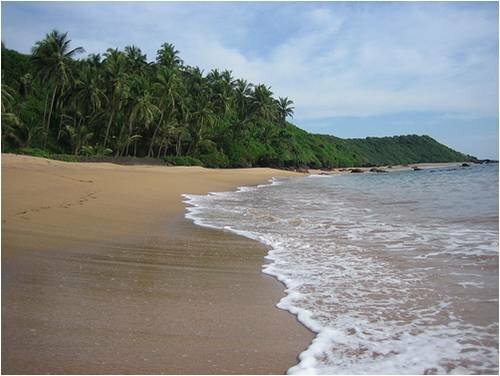 An ultimate beach holiday experience: about 75 km from Panaji (Goa capital) also known as "Khola" beach is an amazing beach of Goa, unspoiled wonderland naturally isolated, hence not frequently visited, as one can approach only by a deserted dirty road from land. Once we anchor private yacht, a dingy will ferry you to/from the beach, Cola is also devoid of stalls/shop and normal hustle & bustle of markets. A cool refreshing dip in the sweet water clear pond, almost on the beach, is like drenching in Ambrosia — that is why “Cola” is matchless. Unique Rocks, white sands and palm trees further enhance this Cola, a picture-perfect beach making your holidaying in Goa a memorable one indeed! Private Yacht reach cola beach after 4 hour yacht trip.